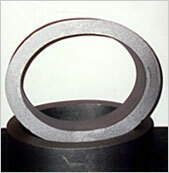 Elliptical rings are available either as seamless or ASME code welded. We will manufacture rings in standard or custom sizes based on your requirements. Rings can be made up to 12” thick by 20” length. Each ring is formed, hot sized, and one edge faced for superior gasket sealing. Our elliptical rings are furnished to SA106-Gr.C / SA105N / SA675gr70 / SA240 Stainless Steel. Required elliptical ring depths for different sized vessels and manways. Required Depth of Ring "L"